From the minute you enter the Palladium at Crown you will be impressed and inspired. Continually updated, it offers a stunningly glamorous venue for all your events and special occasions. Custom-designed carpets, plush wall panelling and superbly appointed fittings, make it one of Melbourne’s most sophisticated settings. And, with state-of-the-art lighting, sound and broadcast facilities, one of the most technologically advanced. 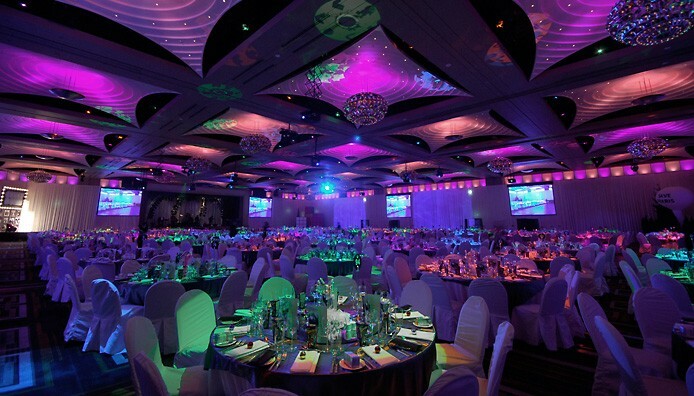 Australia’s largest, pillarless ballroom, the Palladium at Crown can be reconfigured to suit any style and type of business occasion. All you need to do is speak with one of our Event Managers, and they will help realise the best solution for you. Sportsnet Melbourne Cup Day Gala Breakfast Feat. Cosentino!